For the last few days at Shree Peetha Nilaya, we have conducted the prayers for Dhanteras and Diwali. Since Shree Peetha Nilaya is the home of Maha Lakshmi, the holiday of Diwali and Dhanteras has been especially dear to us. Maha Lakshmi is the one who provides everything for Her children, whether we are conscious of it or not. Her blessings are absolutely boundless. 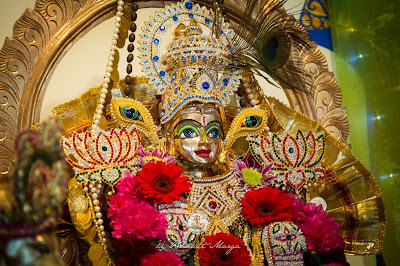 Just as She has made a home in our hearts, we have a made a home in Her heart that we call Shree Peetha Nilaya. Diwali and Dhanteras has been a special time where we have been able to express our love for the Divine Mother. It has been a time for each one of us to show our gratitude for Her grace and guidance. In this span of time, we have also honoured Lord Kubera, and have remembered that God is not to be found outside of ourselves, but rather, within the depths of our hearts. 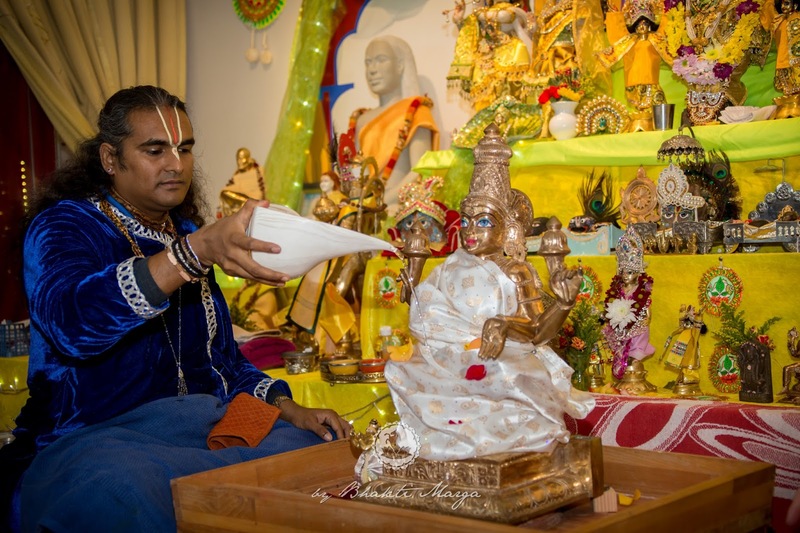 Yesterday, Sri Swami Vishwananda performed an impromptu puja to Maha Lakshmi before the night of Diwali. After the abishekham, Guruji and the other pujaris took their time to decorate Maa in the most beautiful manner. When the curtains opened, Maha Lakshmi was decorated with shimmering jewellery and garlanded with colourful flowers. So today is Diwali. Actually, Diwali has been celebrated for the past five days starting with Dhanteras and onwards. Diwali is celebrated – as you know very well – for the Goddess of Light Maha Lakshmi, Shree. But it’s also celebrated as the victory of good over evil. It is the return of Rama to Ayodhya. In the south of India they celebrate Diwali during the day and in the north they celebrate it at night. It is said that during Rama’s return from Lanka, the people were rejoicing that Ravana was killed. So they lit the way for Rama. Even if on the spiritual path we talk that one has to rise beyond duality, beyond the good and the bad, yet, good qualities have more power than negative qualities. Negative always puts you down, whereas good elevates you. 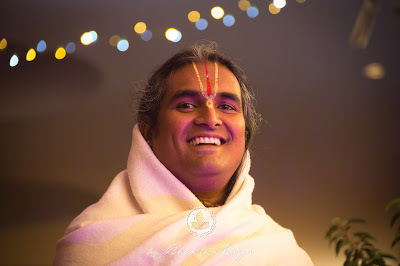 It elevates you until you reach a point where even the good is transformed into bliss. So that good quality doesn’t just stay good forever. That good quality transforms itself into the blissful state. So that’s why on the spiritual path, it’s said that you have to rise beyond good and bad. But yet, to rise beyond good and bad you have to hold onto the good quality that you have because that’s what will make you rise above both qualities. If you hold onto the negative, it will drag you down and you will never reach the goal what you have incarnated for. But the good quality will elevate you till the point where it transforms itself into bliss. So on Diwali we light the lamp everywhere, no? People light the lamp outside but forget to light the inner lamp. And the inner lamp is not a lamp which is visible to the outside, but by concentrating on your good quality the inner lamp lights itself. So, on this Diwali, like all the Diwalis that will continue from now on which you will celebrate, let all your negative qualities be burned by your inner light. Nobody can take that away from you. You see, your negative quality, your good quality, it’s yours, but whichever one you give power to, that will be the one which will carry you. So if you give power to your negative quality by concentrating on it, by feeding it, it will carry you, it will drag you down. 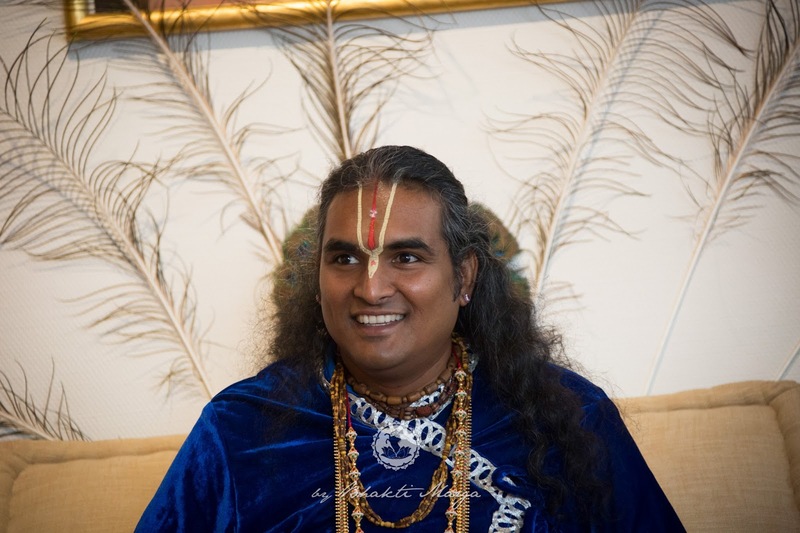 Whereas, if you put more concentration on the inner light which you have, like that it will burn all the negative qualities which you have and it will shine the light what you have inside of you. In all religions they talk about the light, no? The immaterial light. Christ said that if you have the light, you don’t hide it underneath, you put it out. And this is the light of spirituality which is inborn through good karma which you have accumulated, through good punya which you have accumulated through many lives. So it is these good qualities that must awaken. Diwali began later in the night with Sri Swami Vishwananda. 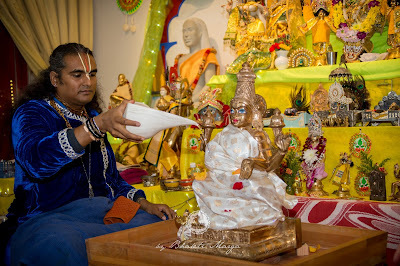 The ceremony consisted of a few pujas, such as Vishwakshena Puja, Ganesha Puja, and Guru Puja. 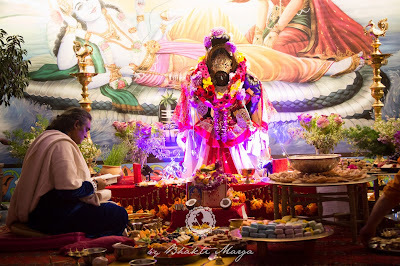 These pujas are the introductory rituals to the Kalash Puja which was performed; it's important to know that the Kalash pot is a representation of Maha Lakshmi Herself. 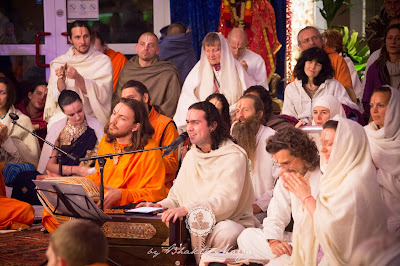 As the prayers were coming to a close, Guruji started to sing a range of devotional songs. The music team joined in and had a few of their own to sing, making the festival complete. After the arati, Guruji gave a guided meditation which provided each person with the opportunity to experience their own inner light. The night concluded with the traditional lighting of candles, which were set around the pathways leading towards the ashram, and along the corridors inside the center. 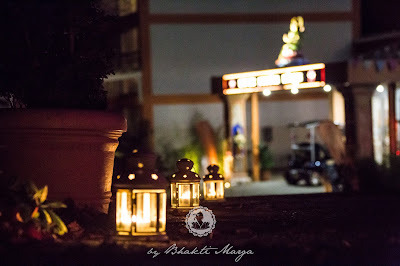 Without question, one of the signature aspects of Diwali is the beauty of the multiple lights, reminding each person that there is an even more magnificent display within oneself, just waiting to be discovered.